Is Chiropractic just about back pain, neck pain and sciatica, or is Chiropractic the art, science and philosophy of invigorating your ability to adapt to your environment, heal and perform? We are local to Falmouth and Penryn, visit us to discover your innate potential for healing, movement and wellbeing; Embodying Life, Activating Living. The mission of LivingRoom is to provide an opportunity for as many people as possible to make a lifestyle choice that enhances your ability to adapt to a stressful modern environment, prevent further injury and promote optimal function. 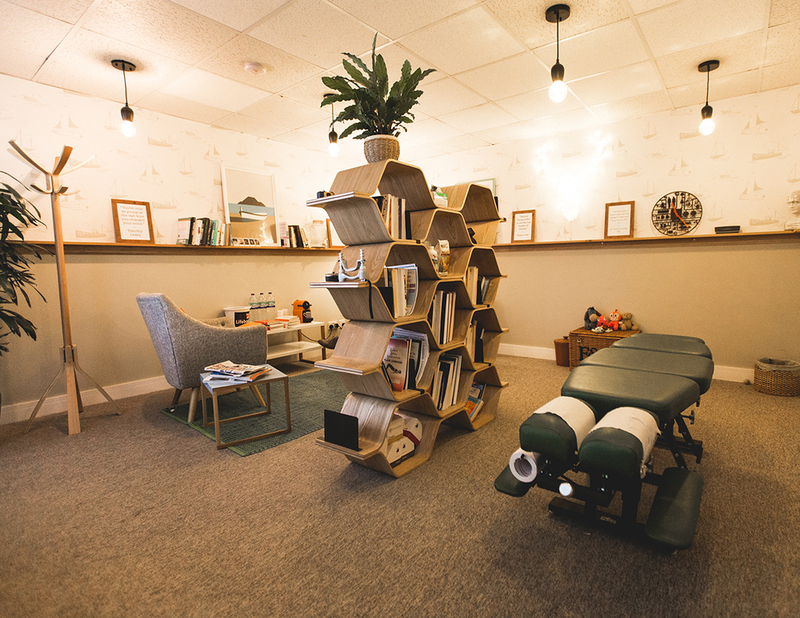 LivingRoom is a boutique Chiropractic practice next to the water in the Falmouth Marina House on North Parade (situated under the Marine Bar between Falmouth and Penryn). You can park easily (free parking), have a coffee and pop in for your adjustment. Your nervous system is your master control system. It is the beginning and end point of everything you perceive, do, feel and think. It delivers all the information you need from the sensors in your body to your brain and then returns the appropriate instructions to your body again. This constant communication network is the feedback loop of life itself. Chiropractors use our hands to stimulate natural movement in areas of the spine that are not functioning as they should. We call these impulses ‘adjustments’ as they adjust the way that the brain and body communicate in response. With an adjustment we hope to progressively restore normal communication and function in the affected area. A Chiropractor will assess your posture, muscle power, balance and movement. We focus on the ability of your brain and body to communicate clearly with each other, which depends largely on your nervous system function. We use various neurological, orthopaedic and Chiropractic tests as well as our hands to feel for any areas that may not be moving or functioning as well as they could. Potentially we can all benefit from Chiropractic care but on your first visit Simon will determine whether he can help you or whether you would be better served by your GP, Physiotherapist or other specialist. You are never too old, too young, too sore or too well to get checked by a Chiropractor. We first determine whether we can help and then explain how you could help yourself to be even better. On your first visit to the Living Room we will discuss your medical history and lifestyle and you will have a Chiropractic Assessment to determine whether we can help you. We will then discuss what Chiropractic is and how it may help you. Simon will explain his findings and any recommendations he thinks are appropriate for just you. Please fill out the 'ONLINE FORM' (button below) or download it, print it and fill it out before your first visit - many thanks. If our plan sounds good you can start care right away. If so - who, where and when? Have you had any of the following in your life? How would you rate your postural/spinal hygiene on a scale (1 = Poor, 10 = excellent)? I consent to a Chiropractic Analysis. I understand that I may be required to wear a gown for this procedure. If I prefer I will arrange for a chaperone to accompany me. I confirm that the information provided in the form is to the best of my knowledge true and correct. jjjjjjThank you for submitting this form. If you park in Falmouth Marina car park and walk down the arcade in centre of the main building you will find the LivingRoom on your right hand side opposite the main Marina office.